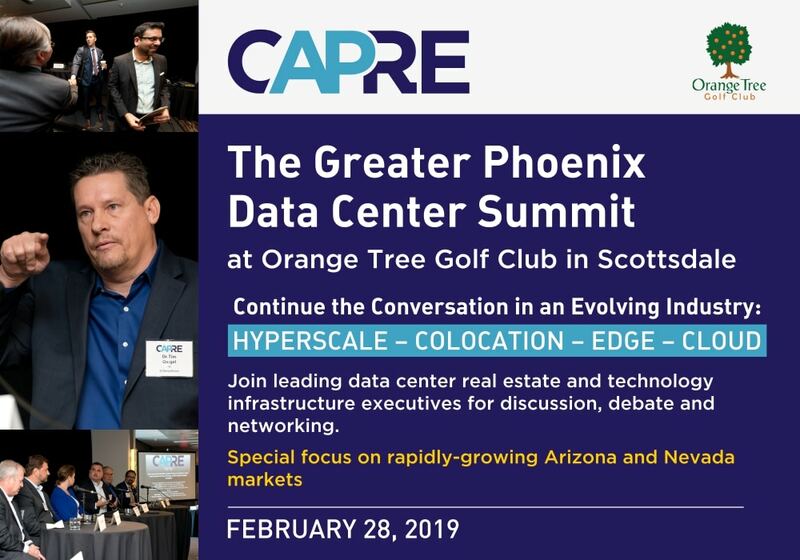 Greater Phoenix is one of the fastest-growing mission critical markets in North America, and will be the focus of CAPRE’s Greater Phoenix Data Center & Cloud Infrastructure Summit on February 28, 2019. With significant developer incentives, low cost and reliable energy, how will Greater Phoenix continue to grow and attract new data center developers in 2019? What types of firms will continue to break ground: hyperscale, colocation or edge? Will Phoenix continue to support Los Angeles/Southern California data center demand? Will other national regions continue to view Arizona as a reliable disaster recovery market? From the end-user perspective, will more enterprise end-users continue to move off-premise, and will their workloads migrate to the Great State of Arizona? Arizona as a Data Center & Cloud Infrastructure Destination: Join all of the most active data center real estate and technology infrastructure executives on February 28, 2019 at Orange Tree Golf Club in Scottsdale.“Networking is a lot like nutrition and fitness: we know what to do, the hard part is making it a top priority,” Herminia Ibarra.